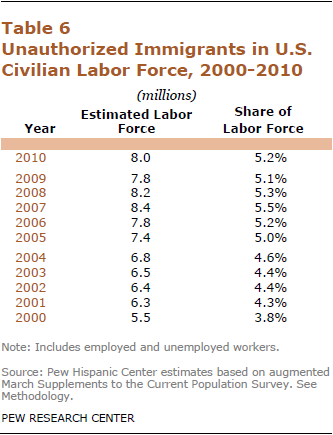 There were 8 million unauthorized immigrants in the workforce in March 2010, down slightly from 2007, when there were 8.4 million. They represent 5.2% of the workforce, similar to their proportion for the past half-decade, when they represented 5% to 5.5% of workers. State patterns differ widely, but generally states with large numbers or shares of unauthorized immigrants also have relatively large numbers or shares in the workforce. States with the largest share of unauthorized immigrants in the workforce include Nevada (10%), California (9.7%), Texas (9%) and New Jersey (8.6%). Because unauthorized immigrants are more likely than the overall population to be of working age, their share in a state’s workforce is substantially higher than their share of a state’s population. California also has the largest number of people in the labor force who are unauthorized immigrants (1.85 million), followed by Texas (1.1 million), Florida (600,000) and New York (450,000. ).